Fictitious Daily Mail story on ‘migrant-infested’ French suburb receives small correction…6 months later! 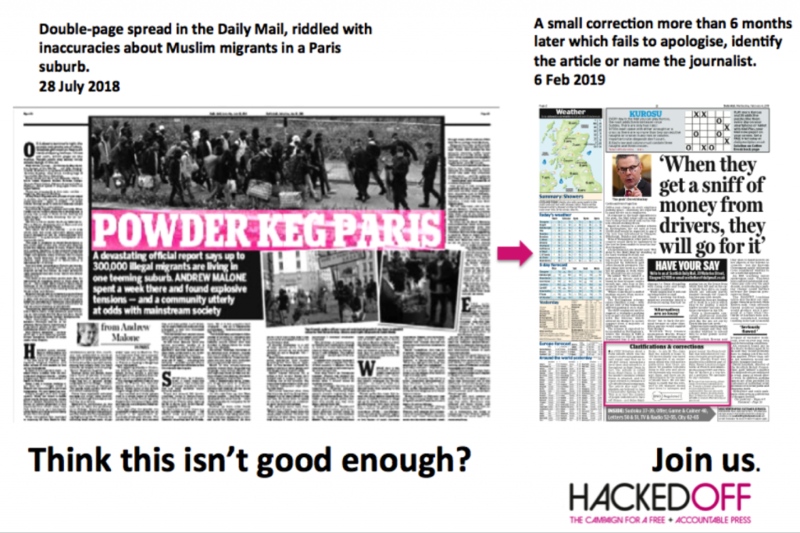 In July last year, the Daily Mail published a double-page spread “exposing a Paris suburb overrun with illegal migrants.” Eight days later the Mail Online were forced to pull the online version of the article following claims of gross inaccuracies. The two-page article by Andrew Malone titled ‘POWDER KEG PARIS’ detailed a French suburb supposedly “teeming” with “up to 300,000 illegal immigrants”. Not long after it was published, it suffered an in-depth public dismantling on Twitter by the former director of the Association Against Islamophobia in France, Marwan Muhammad. Muhammad detailed at least FIFTEEN inaccuracies, including the falsehood that “300,000 illegal immigrants” were living in the suburb of Saint-Denis – when the total population is roughly a THIRD of that at 110,733! Shortly after publication, Miqdaad Versi of the Muslim Council of Britain complained to the press industry’s so-called ‘regulator’ IPSO. More than SIX months later, the Daily Mail has finally acknowledged eight serious inaccuracies. IPSO only required the print correction to be published in the newspaper’s “established corrections and clarifications column” and asked the online correction to be published “as a footnote to the article.” Their full ruling can be read here. The correction wording itself is deeply substandard – deliberately omitting the name of the article and the journalist, and failing to acknowledge the discriminatory agenda behind piece. In the ‘Discrimination’ clause of the Editors’ Code it is STILL not possible to complain about discrimination towards a group, only individuals. This ‘correction’ is NOT good enough. We will not stop until there is justice in the form of an independent regulator. Please support us and donate today! Given that this article featured on a double-page spread in the national newspaper, a clear, prominent correction and apology should have been be rapidly published. And yet; the small correction, which took six months to write, simply finishes with “we apologise for any confusion”. This final blow clearly shows that both the Daily Mail and IPSO do not take Islamophobia seriously. IPSO are planning on issuing Islamophobia ‘guidelines’ later this year. But guidelines have no effect – and IPSO can’t even change their own code without the permission of newspaper editors. As we have seen time and time again, their actions do not match their words, and the six months it’s taken to obtain this measly correction proves this once more. Think this isn’t good enough? Join us. Our fight is now more important than ever, we need independent regulation – please help us keep up the fight by donating today!